Tinda is a plant in cucurbits family, a prolific vine, and is grown as an annual.Plants are vigorous and productive. The fruit is approximately spherical, and 5–8 cm in diameter. The seeds may also be roasted and eaten. This unique squash-like gourd is native to India and used a lot in North Indian curry . For this recipe you need to use the small tender ones. Scrape tinda , remove the top and scope out seeds. Partially cook tinda in salted hot water . Heat oil and onion and saute till light golden. Add besan cook till the raw smell is gone. Add all the masalas,salt and cook another minute . Add gur and mix well and check seasoning . Cool and stuff the tinda with the above mixture. Heat oil and add ginger garlic paste . Cook for a minute and add onion paste. Cook till the oil separates and add chili powder. Add tomato and mix well and cover. Cook till the oil separates on medium flame. 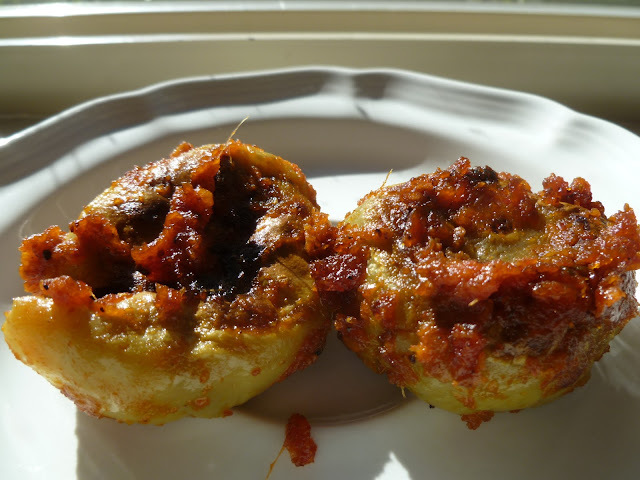 Add the stuffed tinda and 1/4 cup warm water. Cover and cook till the tinda is fork tender. Add 1/4 cup hot water if you need some gravy. Love stuff vegetables. got to try this too. Heard lot about this tinda,but never cooked with them,looks fabulous.